Not to be confused with Toledo, Spain. Toledo, officially the City of Toledo, (Cebuano: Dakbayan sa Toledo; Tagalog: Lungsod ng Toledo), or simply known as Toledo City, is a 3rd class city in the province of Cebu, Philippines. According to the 2015 census, it has a population of 170,335 people. 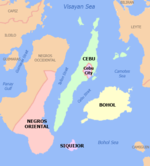 Toledo City is bordered to the north by the town of Balamban, to the west is the Tañon Strait, to the east is Cebu City And Naga and the town of Minglanilla, and to the south is the town of Pinamungajan. On 18 June 1960 Toledo became a chartered city under Republic Act No. 2688. 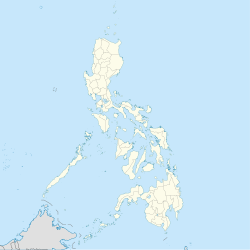 Toledo is about 50 kilometres (30 mi) away from Cebu City and is widely known for its huge mining industry owned by Atlas Consolidated Mining and Development Corporation, which is the umbrella of Carmen Copper Corporation and its Toledo Mine. It is formerly known as Pueblo Hinulawan. In 1945 local Filipino forces of the Philippine Commonwealth Army from the 8th, 82nd, 83rd, 85th and 86th Infantry Division aided by Cebuano guerrilla resistance fighters, battled against the Japanese Imperial forces and liberated the town of Toledo. On June 19, 1960, Toledo became a chartered city under Republic Act No. 2688. It was made into a city through the efforts of then Congressman Manuel A. Zosa, representative of the old Sixth District of Cebu, who authored Republic Act No. 2688. Following the canonization on 21 October 2012 of Visayan teen martyr Pedro Calungsod (1672), the hilltop parish of Cantabaco became the first shrine and church named after the second Filipino saint. The barangays of Cantabaco and Poog  have limestone cliffs that local climbers have developed into popular crags for sport climbing. Máximo Macapobre was a 19th-century Philippines leader and activist. Philippine Star, Vanessa Balbuena (14 October 2012). "Special feature :In honor of Blessed Pedro". Archived from the original on 21 March 2017. Wikimedia Commons has media related to Toledo.